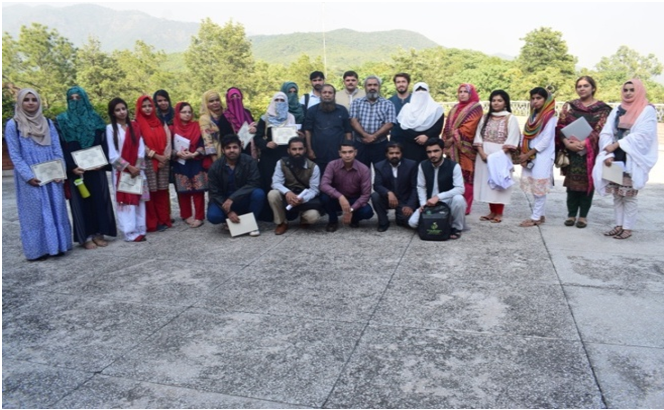 PASTIC organized a training workshop on "Make Your Research Life Easier With Mendeley Tool" which was held on October 24-25, 2018 at PASTIC National Centre, Quaid-e-Azam University Campus, Islamabad. The objective of this workshop was to build the capacity of young researchers and to enhance their skills in literature search, citation, sharing and discovering of new research. Dr. Maryam Ibrar was the resource person of the workshop. 30 participants from Quaid-e-Azam University and PIDE participated in this training workshop. Group Photo of Mendeley Training at PASTIC National Centre . This workshop was part of a series that are regularly organized by PASTIC to train the young researchers on modern ICT tools and techniques useful in research. There are many citation tools available for helping researchers in citation during completion of their thesis. The Mendeley application owes a unique position among these tools being free, smarter and user-friendly. Besides it provides an excellent platform where researcher can search jobs/fellowships, research funds, find research groups, search literature etc. Moreover it is a cross-platform application (Windows, Mac, Linux, iPhone) that helps researchers to manage and annotate their scientific paper collections. Citation data from its cloud library can be accessed across multiple devices e.g., Laptop, PC, iphone etc. Mr. Zaheer Nasir, Manager (Trainings) and Mr. Saif Ullah Azim, Principal System Analyst distributed certificates among the participants.